Welcome. I am so happy that you stopped by. My garden gate is always open for you to come in and sit, have a cup of tea and relax while I share with you inspirations for my paintings. This week I am very happy to participate in Pink Saturday's Breast Cancer Awareness weekend. As a nine year breast cancer survivor I am thankful and committed to use my art to help raise money to find a cure. Please join me for a "pink" tea party to celebrate. 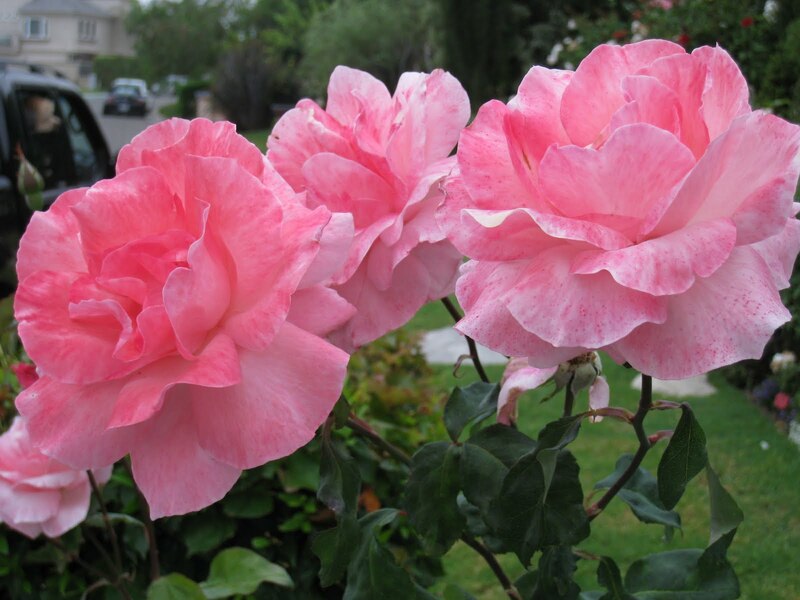 I just picked the last of my pink roses and would love to share them with you. My Our Lady of Guadalupe pink roses were just waiting for you to stop by. Bentley, my Studio Assistant, is in the garden looking for pink roses. Rose painting inspired by pink roses. Inpatients and Cosmos are still blooming. There is power in united prayer to find a cure for breast cancer. Jesus said " Where two or three are gathered in my name, I am there among them". Mt:18:20. Let's all join together as we celebrate Breast Cancer Awareness Month to pray for a cure. love, love, love the pink flowers!! and of courese the puppy was so cute too! i really enjoyed your post! thanks for sharing! I've got a few left also-need to take them inside so I can enjoy them before it's too late-Happy PS! Erin, you too?! I've been breast cancer free since 1996! God bless you, girlfriend! Obviously, your joy at being healed shows so beautifully in your joyful art! Stay healed! Thanks so much for your visit today and your sweet comments. Congratulations on your 9 yrs. That is so wonderful! Your post today is beautiful. Love all the blue and white china mixed with the gorgeous pink roses. Have a lovely weekend! Beautiful flowers...and the perfect color PINK. We all share in the prayer..
Oh Erin your blog is so lovely. 9 years is so amazing. You are beautiful & so is your assistant. Beautiful dishes, beautiful flowers, and I am loving your art work! Wonderful pink post! Prayer works! Your post was wonderful...and congrats to you for your cancer milestone!! My good pal just hit the 18 year mark.....and I have another one who is at year one. I love your gorgeous roses and paintings and your fabulous Bentley! have found your wonderful blog! BEAUTIFUL inspiration and your artwork! What a wonderful thing you are doing to help raise awareness and a cure! I am in my second year of getting tested and so far ok. I think it is important...even for 35 year olds like me! Thanks for all you do!! Hi Erin I love all the pink touches especially your painting. Just beautiful. I have been Bladder Cancer free for 2 years now and the more research that is done on Breast Cancer the closer we are to a cure for all cancers. Happy Pink Saturday. pls visit again ~ tea is always on! Happy Pink Saturday and such a lovely and inspiring post Erin! Thank-you for sharing your story. Oliver loves Bentley and says"I wish we could hang-out!" Susan Ramey Celeveland won your paining at my place! She is SUPER happy. Congratulations on being a cancer survivor. Your post was lovely and so was your painting. Thanks so much for sharing. Your painting is lovely! The photos and flowers are gorgeous, too. A great cause and a great way to support it! Thank you for sharing. Sorry I'm so late...we had a big wedding on Pink Saturday and we are just now recooperating! Oh, how beautiful - just the name of the roses makes me shiver - we don't have them inFlorida. Bentley continues to entertain me - its like he really is trying to help you find just the right inspiration. I love your blog with its job and Bible Verses. Hello Erin, I'm still making my Pink Saturday visits. Thank you so much for stopping by and leaving a sweet comment. Congrats on the 9 years. That is so wonderful, love your post, your blog is beautiful, roses are fabulous and your paintings are amazing! What a beautiful post and I love the pink flowers and what pink stands for. Congratulations on your 9 years of being cancer free! I wish you many many more to come. Beautiful painting as usual...I love to see what you get inspired by. Have a wonderful Thursday. My mother is a 30 year breast cancer survivor, and they have come a long way since then. There is still a lot to learn though. I enjoyed looking at all the pink flowers! Nice post. I love it very much. Keep it up.